Tofu (Soy Bean Curd) is a refrigerated vegan pantry ingredient that makes a wonderful addition to many Oriental recipes, and can be used to make an uncheese sauce. This is a one pound block of firm tofu, a bean curd made from soy beans. Tofu is a very versatile product. It can be broiled or roasted. It can be used in salads, soups, stir fries, dips, and in making cream sauces. 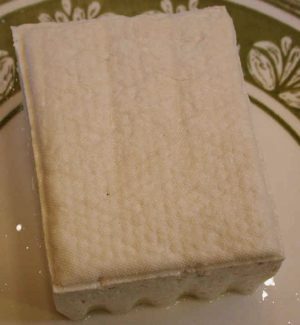 Tofu has very little flavor of its own, but readily picks up the flavor of the other ingredients. See nutritional information below. 1. Descriptive terms (soft, firm, extra firm) vary in usage between manufacturers as there are no standards for the various types of tofu. 2. Manufacturers use either magnesium chloride (nigari), calcium sulfate, or both in varying quantities to precipitate the protein. Calcium and magnesium contents will vary accordingly.